Did you know the summer of 2016 was the first in which Lyme disease is thought to have originated in Washtenaw County? It was. Now, 2017 is predicted to be a particularly bad year for ticks. In this week’s edition of WEMU’s "Issues of the Environment," David Fair explores why that is and what you can do about it with a medical entomologist from Michigan Department of Health and Human Services. * 2017 is predicted to be an abundant year for ticks, and residents of the greater Washtenaw County region need to be aware that Lyme disease, as well as other tick-borne illnesses, are possible. * 2016 was the first summer that Lyme was reported to be transmitted in the county, with four of the 17 cases detected likely originating locally. * Erik Foster, Medical Entomologist with the Michigan Department of Health and Human Services, says the black-legged tick has been expanding its range for decades and the lack of harsh winter conditions encourages the population. He says that climate change is likely to not only increase the number of cases of Lyme disease in our region, but also other tick-borne diseases. Lyme disease is caused by the bacterium Borrelia burgdorferi and is spread by the bite of an infected blacklegged tick. Typical symptoms include fever, headache, fatigue, aching muscles or joints, and a skin rash at the site of the tick bite that may look like a bull’s eye or target. Untreated infections may spread to the joints, heart and nervous system. Infections are diagnosed based on symptoms and the possibility of contact with infected ticks. Residents should be aware of the symptoms of Lyme disease and check for ticks after enjoying outdoor activities. Health care providers must be ready to diagnose cases and provide early, appropriate treatment. Most cases of Lyme disease can be treated successfully with antibiotics. This recent finding has prompted WCPH and the Michigan Department of Health and Human Services to begin the process of identifying areas where the blacklegged tick may be present in the county. During the peak tick activity season, staff and collaborators from Michigan universities will start collecting, identifying and testing ticks from wooded and natural areas. To date, no ticks from Washtenaw County have tested positive for Lyme disease. Most cases of Lyme disease can be treated successfully with antibiotics. Patients treated with appropriate antibiotics in the early stages of Lyme disease usually recover rapidly and completely. Antibiotics commonly used for oral treatment include doxycycline, amoxicillin, or cefuroxime axetil . Steps to prevent Lyme disease include using insect repellent, removing ticks promptly, applying pesticides and reducing tick habitat. While it is a good idea to take preventive measures against ticks year-round, be extra vigilant in warmer months (April-September) when ticks are most active. * Avoid wooded and bushy areas with high grass and leaf litter. * Walk in the center of trails. * Use repellents that contain 20% or more DEET (N, N-diethyl-m-toluamide) on the exposed skin for protection that lasts up to several hours. Always follow product instructions. Parents should apply this product to their children, avoiding hands, eyes and mouth. * Use products that contain permethrin on clothing. Treat clothing and gear, such as boots, pants, socks, and tents. It remains protective through several washings. Pre-treated clothing is available as well. * Other repellents registered by the Environmental Protection Agency (EPA) may also be effective at preventing ticks. An insect repellent search tool can be found here: Find the Insect Repellent that is Right for You. * Bathe or shower as soon as possible after coming indoors (preferably within two hours) to wash off and more easily find ticks that are crawling on you. * Conduct a full-body tick check using a hand-held or full-length mirror to view all parts of your body upon return from tick-infested areas. Parents should check their children for ticks under the arms, in and around the ears, inside the belly button, behind the knees, between the legs, around the waist, and especially in their hair. * Examine gear and pets. Ticks can ride into the home on clothing and pets, then attach to a person later, so carefully examine pets, coats, and day packs. Tumble clothes in a dryer on high heat for an hour to kill remaining ticks. 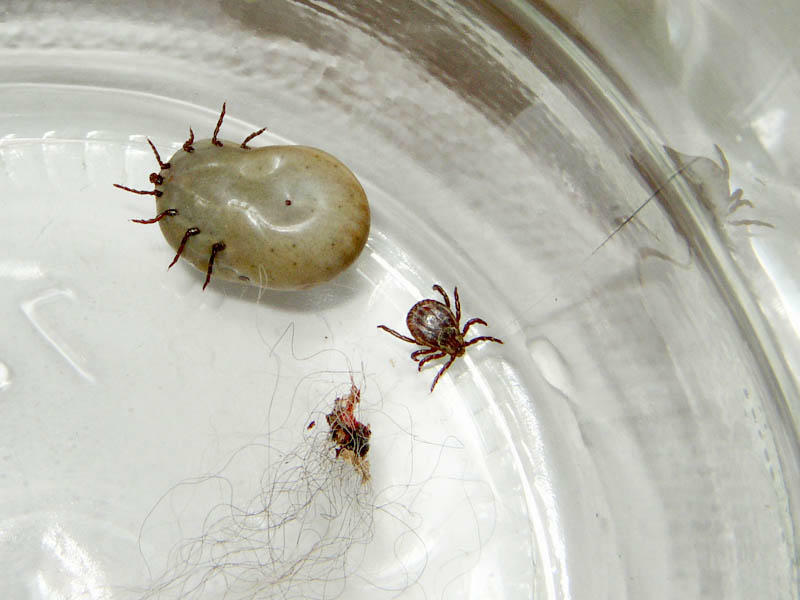 * To remove a tick, use tweezers and grip the body firmly and pull straight out of the skin. Do not twist the tick. After removing the tick, clean the bite area and your hands. If you choose to dispose of a live tick, submerse it in alcohol in a sealed bag or container, wrap tightly in tape or flush it down the toilet. Never crush a tick with your fingers. * Tick identification and testing is available from the State of Michigan. If infected ticks are identified in a community, the risk of Lyme disease infection for people is also present. Washtenaw County Public Health encourages residents to submit ticks for identification. The State of Michigan has a program to identify ticks, and if it is a live blacklegged tick, test for Lyme disease. There is no fee charged if the tick was found on a person. Ticks can be submitted with or without a tick submission kit. Testing information is available at www.michigan.gov/lymedisease. Washtenaw County Public Health also has a limited number of kits available. * Between 1992 and 1996, there were 2 cases of Lyme disease in Washtenaw County. * Between 1997 and 2001, there were 3 cases of Lyme disease in Washtenaw County. * Between 2002 and 2006, there were 15 cases of Lyme disease in Washtenaw County. * Between 2007 and 2011, there were 25 cases of Lyme disease in Washtenaw County. According to our data, Lyme disease prevalence is growing in Washtenaw County. Due to the fact that the CDC's data only represents confirmed cases, the actual quantity of Lyme disease cases may be far greater. We estimate a total of 568 true cases of lyme disease in Washtenaw County. * Anaplasmosis is transmitted to humans by tick bites primarily from the blacklegged tick (Ixodes scapularis) in the northeastern and upper midwestern U.S. and the western blacklegged tick (Ixodes pacificus) along the Pacific coast. * Babesiosis is caused by microscopic parasites that infect red blood cells. Most human cases of babesiosis in the U.S. are caused by Babesia microti. Babesia microti is transmitted by the blacklegged tick (Ixodes scapularis) and is found primarily in the northeast and upper midwest. * Borrelia mayonii infection has recently been described as a cause of illness in the upper midwestern United States. It has been found in blacklegged ticks (Ixodes scapularis) in Minnesota and Wisconsin. Borrelia mayonii is a new species and is the only species besides B. burgdorferi known to cause Lyme disease in North America. * Borrelia miyamotoi infection has recently been described as a cause of illness in the U.S. It is transmitted by the blacklegged tick (Ixodes scapularis) and has a range similar to that of Lyme disease. * Heartland virus infection has been identified in eight patients in Missouri and Tennessee as of March 2014. Studies suggest that Lone Star ticks may transmit the virus. It is unknown if the virus may be found in other areas of the U.S.
* Lyme disease is transmitted by the blacklegged tick (Ixodes scapularis) in the northeastern U.S. and upper midwestern U.S. and the western blacklegged tick (Ixodes pacificus) along the Pacific coast. * Powassan disease is transmitted by the blacklegged tick (Ixodes scapularis) and the groundhog tick (Ixodes cookei). Cases have been reported primarily from northeastern states and the Great Lakes region. * Rocky Mountain spotted fever (RMSF) is transmitted by the American dog tick (Dermacentor variabilis), Rocky Mountain wood tick (Dermacentor andersoni), and the brown dog tick (Rhipicephalus sangunineus) in the U.S. The brown dog tick and other tick species are associated with RMSF in Central and South America. * Tularemia is transmitted to humans by the dog tick (Dermacentor variabilis), the wood tick (Dermacentor andersoni), and the lone star tick (Amblyomma americanum). Tularemia occurs throughout the U.S. The Lone Star tick is not invading Michigan. According to a Michigan State University entomologist, the tick’s population hasn’t increased here in 25 years. 89.1 WEMU's Amanda LeClaire reports on which tick species are increasing this year in Washtenaw County. A battle is brewing in Lansing between some lawmakers and Governor Rick Snyder’s office. The Michigan Public Radio Network's Cheyna Roth reports on the debate over legislation that would restrict the sale of e-cigarettes in Michigan. Another planned deer cull in Ann Arbor continues to generate controversy. Last winter, 63 animals were killed in an effort to thin the herd in the city. This year, city council has authorized the killing of up to 100 more animals and the sterilization of up to 60 female deer. That plan was approved on a 9-2 vote. David Fair’s guest on this week’s edition of WEMU’s "Issues of the Environment" is Mayor Christopher Taylor, who voted against the cull.